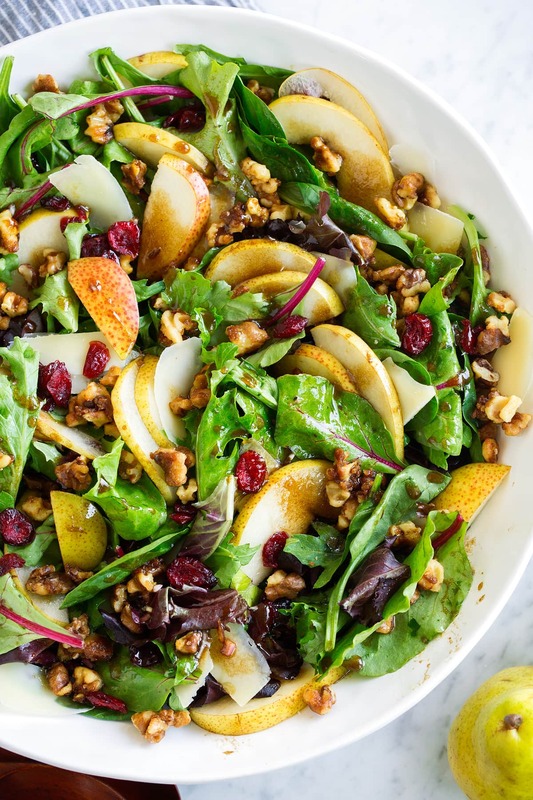 This flavorful Pear Salad will easily become a favorite fall recipe! 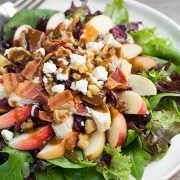 It’s layered with tender spring greens, sweet juicy pears, crunchy candied walnuts, salty rich parmesan and a tangy balsamic vinaigrette. A highlight of any meal! The salad has the perfect balance of sweet and tart, and I love the blend of textures. It’s one of those easy to throw together recipes that is set to impress everyone at the dinner party. 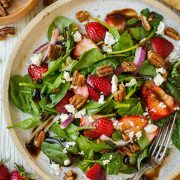 Everyone loves a good strawberry salad but fall needs it’s own seasonal salad and this should be it! Try it soon while pears are in their seasonal prime! How to Ripen Pears Quicker? To speed the ripening process up place pears in a paper bag with a ripe banana or apple, keep at room temperature (this should speed the process by a couple days). How to Tell When They’re Ripe? Pears should yield slightly to pressure when pressed near the stem when they’re ripe and ready to eat. To prolong their shelf life store in the fridge. It obviously won’t stop ripening but it will delay it. You don’t want to use crunchy, sour unripened pears or soft mushy, mealy overripe pears in this recipe so try to plan accordingly based off what you found at the store. Pears are easily susceptible to bruising and abrasion so handle them gently and store them in a single layer. Which Type of Pear is Best? I’ve made this salad with both anjou pears and bartlett pears and both are great (so go with what’s ripe/on sale). Anjou have a slightly thicker skin but it’s still tender so no need to peel. Of course pecans are another good choice in place of walnuts if that’s what you’ve got on hand. I do love the parmesan here (and those thin shaved slices are something new for a change in salad) but gorgonzola or goat cheese would also work here if you’ve got some to use up. 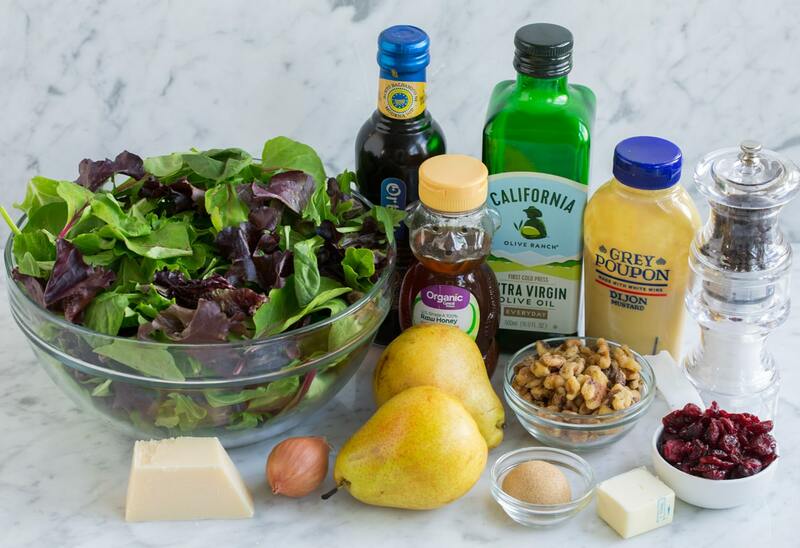 Cut the pears and dress the salad right before you serve it. Pears can start to brown a bit where cut (that delicate skin) and the dressing will start to wilt the salad if it sits. The dressing can be made a day or two ahead and chilled. Stick with dark balsamic vinegar instead of the white balsamic. It has a more tart, stronger flavor that works better in this recipe. 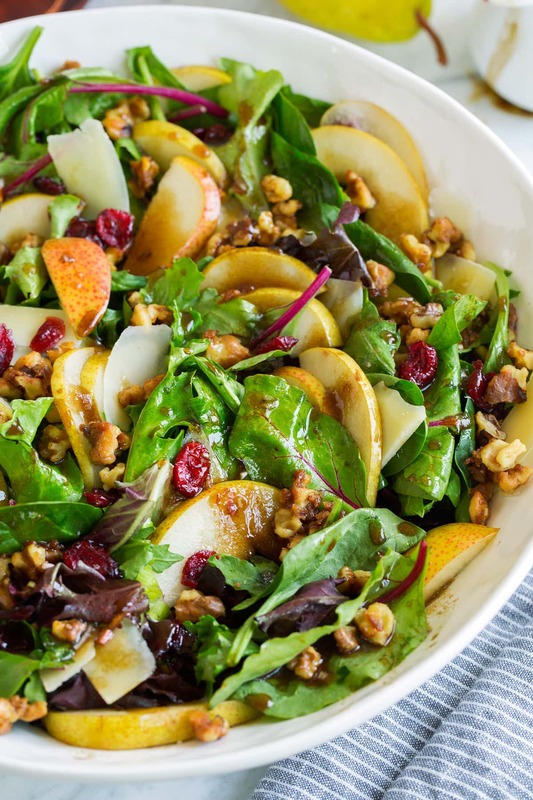 This flavorful Pear Salad will easily become a favorite fall recipe! 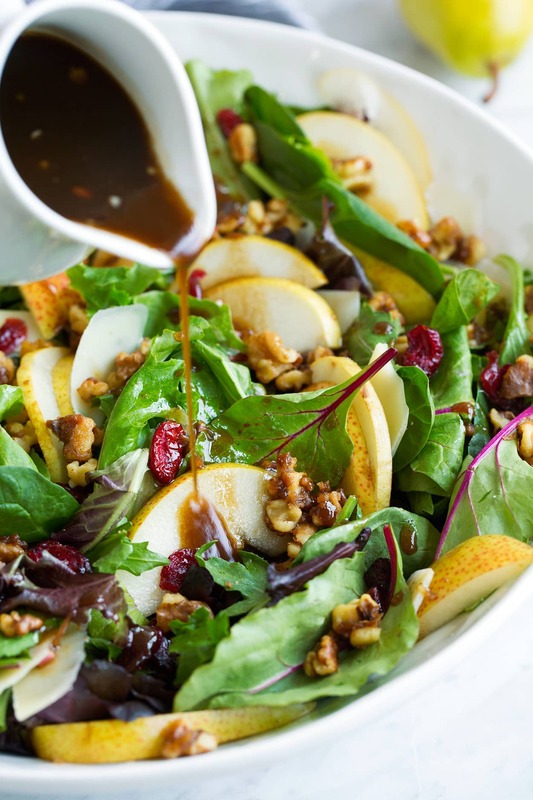 It's layered with tender spring greens, sweet juicy pears, crunchy candied walnuts, salty rich parmesan and a tangy balsamic vinaigrette. A highlight of any meal! To a blender add olive oil, balsamic vinegar, honey, dijon mustard, diced shallot and season with salt and pepper to taste (I used a 1/4 +1/8 tsp salt and 1/4 tsp pepper). Blend mixture until well emulsified, about 20 seconds. Store in refrigerator in an airtight container until ready to serve. In a medium skillet melt butter along with brown sugar over medium heat. 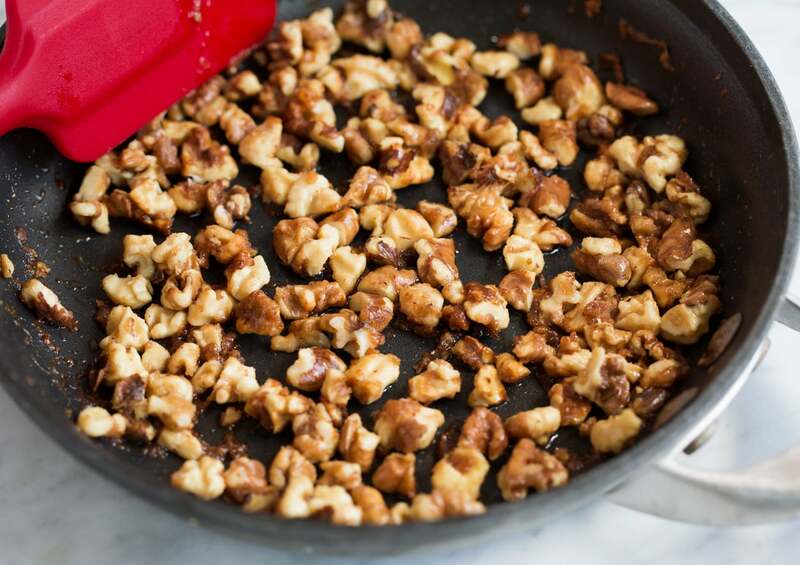 Once mixture has melted add walnuts and cook, stirring constantly until caramelized, about 2 minutes. Transfer to a plate in a single layer to cool. 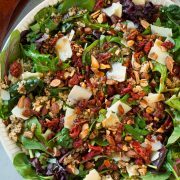 Layer lettuce and pears in a large bowl and toss with dressing, then top with parmesan, dried cranberries and candied walnuts and serve (alternately just layer all the salad ingredients then drizzle with dressing. Note: top this salad with dressing just before serving as it will wilt the lettuces after a while). Recipe source: inspired by a recipe from a friend. Thanks Audrey! Sallie Cross: I prepared this yummy salad following the recipes exactly. Served it with cooking classy beef stew. Perfect! Both dishes had were delicious.